For AFI, the name of the game has always been about evolution, so it’s always a nail-biter to see where they land with each release. Enter The Blood Album, proving they are as fired up now as when they began. The blood, sweat, tears and thousands of sold out shows have morphed AFI into one of the most ferocious live acts in the world today. They will be bringing it to Australia in full force this September, showcasing songs from across their incredible catalogue. Joining the band are Basement. Since the release of their Triple J Feature Album Promise Everything, there has been no stopping the UK act on their road to gaining an intensely devoted posthumous following. 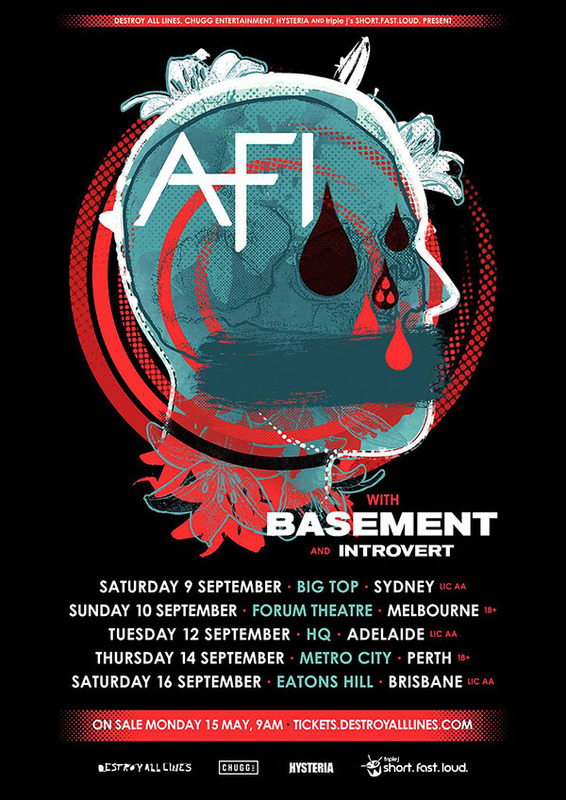 Returning to Australian shores fresh from their sold out headline tour in 2016, the band will be gearing up for their biggest tour here to date, where they will be bringing their highly energetic and engaging live show to the stage in support to AFI. Completing the lineup is Introvert. With an eccentric, raw and emotional live performance, Introvert has been making waves both here in Australia and Overseas. They were recently featured as Triple J Unearthed’ Featured Artist and one of their “10 artists to watch in 2017”. Introvert also recently completed national tours with Birds of Tokyo, Balance and Composure, Hellions and a spot on Groovin the Moo, and are a killer addition to this incredible lineup. Tickets on sale 9am Monday 15th May.